When Uncle Ron comes to visit, he just won't seem to leave! Ian, Mum and Dad don't quite know what do with him - if he's not eating them out of house and home, he's chattering away to the spirits of the dead. But not interesting spirits. All they ever seem to talk about is the colour of doors and what's stuck behind the fridge. So Ian hatches a plan to get rid of Uncle Ron once and for all. 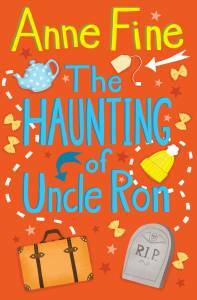 The Haunting of Uncle Ron is a book by Anne Fine for solo readers in the middle age group, illustrated by Vicki Gausden. It was published by Barrington Stoke on 15th February 2014. Click the logo to order The Haunting of Uncle Ron from .